The Union Home Minister, Shri Rajnath Singh addressing at the inaugural session of Confederation of All India Traders National Conclave, in New Delhi on July 23, 2018. The Union Home Minister Shri Rajnath Singh has said economic reforms undertaken by the Government under leadership of the Prime Minister Shri Narendra Modi during the last four years will push India among the world’s top economies. Inaugurating the National Traders’ Conclave organised by the Confederation of All-India Traders here today, he said in the year 2014, according to a survey by a reputed consultancy, India was ranked 9th among the world’s Top Ten economies and today we have raced ahead of France to emerge as the top 6th. “I am confident, as economists predict, in the next two-three years India’s economy will be among the top five. With this pace of GDP growth, by 2030 we will break into the world’s Top Three economies,” said Shri Rajnath Singh. “India is the most attractive destination for foreign investors and received more than $150 billion FDI in last four years. In ‘Ease of Doing Business’, the country’s ranking has improved from 142 to 100. Besides, Manufacturing sector has got a fillip with the ‘Make in India’ programme. In 2014, while there were only two mobile phone factories in India, today we have 120 handset manufacturing units,” he added. 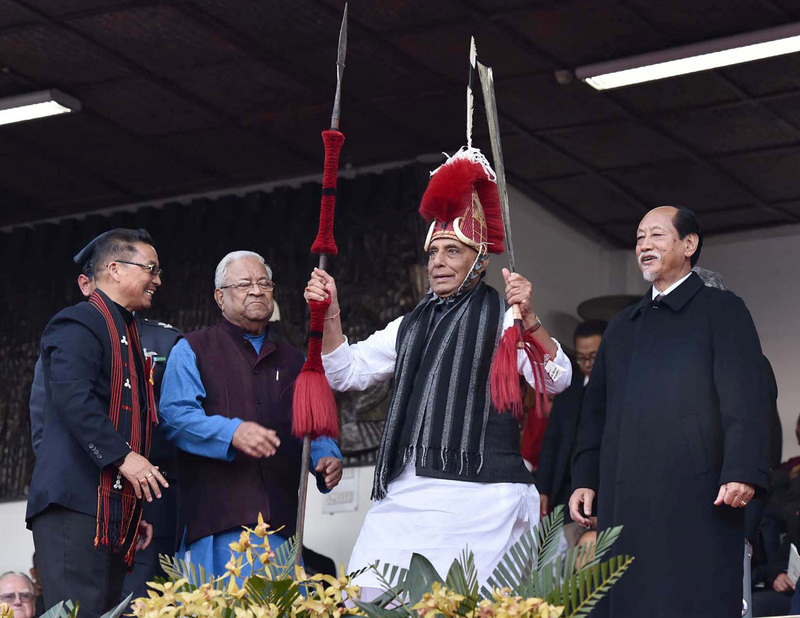 Shri Rajnath Singh said the Prime Minister Shri Narendra Modi has initiated key structural and procedural reforms in the economy. “You don’t need an economist to steer the country; you only need a realist visionary to realise the potential of our economy,” he said. Citing the Direct Benefit Transfer (DBT), Goods & Services Tax (GST), amendment to the Insolvency & Bankruptcy Code and the historic Demonetization, Shri Rajnath Singh said India’s GDP growth rate in the last four years has outpaced the inflation rate every year since 2014. “Government has recently substantially hiked Minimum Support Price (MSP) for foodgrains. This will benefit the farmers and boost rural spending, thereby giving a fillip to retail trading. Under the DBT, the role of middlemen has been eliminated; subsidies worth Rs.3,65,000 crores under 431 schemes have been directly passed on to beneficiaries. Traders overcame hiccups during demonetization to support the momentous decision in the long term benefit of the country,” he said. Stating that the GST rates have recently been slashed on several items and that many items have been brought under Zero percent and 5% slabs, the Union Home Minister said the Government is open to further review of the slabs. “Out of 6.5 crore traders and shopkeepers, around 1.25 crores have registered under the GST. As per the Economic Survey, during the one year, November, 2016-2017, more than 1.15 crore returns have been filed. 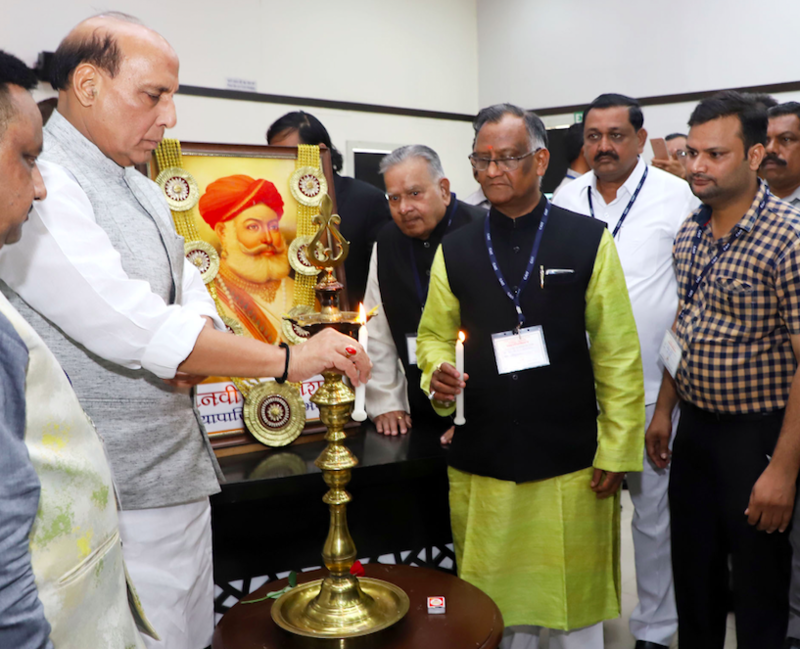 GST is a major taxation reform in the country where only 6.10 crore people are under the taxation regime out of a population of more than 130 crores,” said Shri Rajnath Singh. 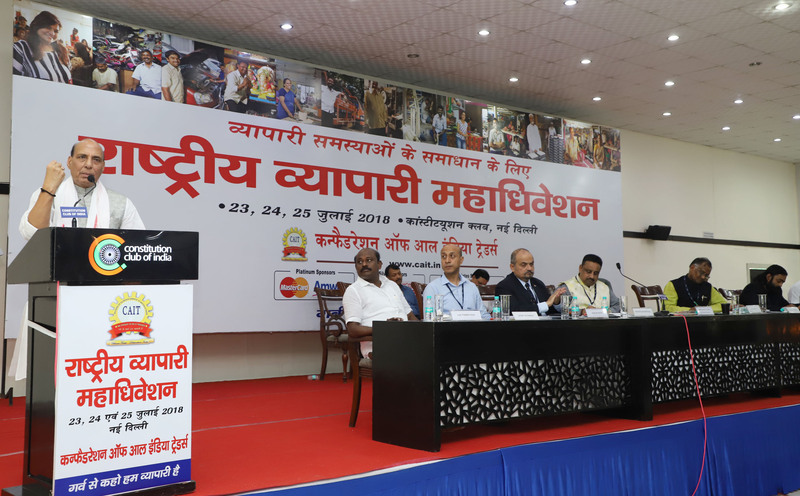 Underlining that the traders are a strong pillar in the country’s economy, Shri Rajnath Singh sought the cooperation of the trading community to realise the Prime Minister Shri Narendra Modi’s dream of doubling India’s economy by 2022. “There are 6.5 crore retail traders in the country; government wants to strengthen the trading system,” said Shri Rajnath Singh. निवेशकों के लिए आज भारत Attractive Investment Destination है. हमारा व्यापारी वर्ग ईमानदारी के साथ व्यापार करना चाहता है, हमारी सरकार ने पारदर्शिता और और सशक्तिकरण के लिए पूरी कोशिश की है. आपके महाधिवेशन में जो जो विचार और सुझाव सामने आयेंगे, हमारी सरकार उसपर गंभीरता पूर्वक विचार करेगी.